Connecting your guitar to the amp and blazing all those creative tunes playing on your mind can be the best feeling for every guitarist. A lot of guitarists play for their personal satisfaction and do not have regular access to studios. So their apartment or home becomes the ideal place for practicing. Sadly though, neither your neighbors nor your family members will appreciate loud music most of the time. You can’t just plug your guitar and start practicing at night if you live in a regular community. Only a high-quality headphone can save you from this dilemma. With the right headphone, you won’t need to miss your practice in order to avoid sound complaints from management. However, you can’t just expect any regular headphone to work great with your amp. As you’ll be creating raw sound, you need a professional grade headphone designed specifically to work with guitar amps. But, picking a headphone for this purpose can be a tedious task. As the market is populated with loads of different models, it can be confusing and frustrating choosing the right headphone for your guitar amp. To save you from all these troubles and make your playing a pleasant experience, we’ve curated a list of 5 best headphones for your guitar amps. Our expert team has gone over all the popular options in the market and chose these 5 based on their sound and build quality, user experience, and convenience. 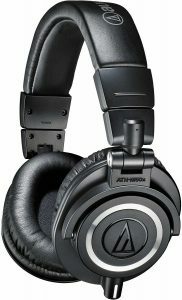 The Audio-Technica ATH-M50x has been picked as the best headphone by our editors for its insane bass response, amazing sound clarity and wide frequency range. It’s the perfect solution for any guitarist in need of a stunning headphone for their amps. This model is praised heavily by industry icons, most notably by James Hetfield of Metallica who uses it for practicing almost every one of his new riffs. The circumaural around-ear design of this product will allow your ears excellent sound segregation while providing a single-ear monitoring feature. The bass response of the Audio-Technica ATH-M50x is one of the finest we’ve experienced till now. It’ll provide you just the right amount of punch without sounding extra thick or muddy, making this headphone also ideal for bass players. We know many guitarists, who don’t like permanent cables in their headphone due to the hassle it can bring in the long term. Luckily, the Audio-Technica ATH-M50x features a detachable cable. It comes bundled with 3 different cables including one 3m curly cable and two 3 and 1.2-meter straight one. You can buy a larger cable which will provide you the freedom of moving around while practicing. This feature also allows this product to be the ideal carry-on headphone when you’re traveling or going for a gig. Although this headphone doesn’t come with an exact noise cancellation feature, the noise isolation quality of this item is good enough to deal with that. The extended frequency range of this device ensures you hear every single detail while playing. This headphone is not only for use with your guitar amps but also performs hundred percent with any stereo device. The modern yet comfortable design of this model with its amazing set of features has made this headphone one of the most popular around the globe. 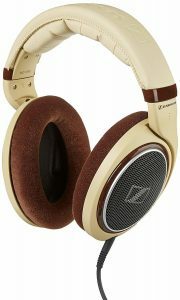 It has been featured as only one of the two ‘outstanding’ headphones by both Amazon and CNET. At its price tag, we don’t see any competitor challenging its position anytime soon. More than 4,900 Amazon reviewers will agree with us regarding this matter. Sennheiser has been leading the headphone industry for more than half a century, thanks to the high-tech build quality and organic sound provided by this brand. The HD 598 SR continues the legacy of the German manufacturer with its organic and balanced sound. It’ll be the best choice for any Sennheiser fanatic. 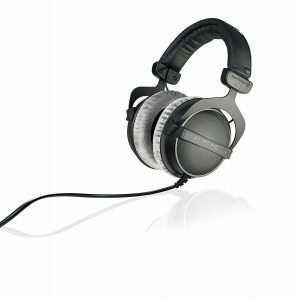 The Sennheiser HD 598 SR features an open back, over the ear style design with a sturdy yet comfortable build. The headband is padded with leatherette whereas the ear pads are covered in a lavish velour to provide maximum comfort for those long practice sessions. As with most of their other models, Sennheiser has left no stone unturned to produce a crisp balanced tone with the HD 598 SR. The sound reproduction is exceptionally accurate, thanks to its feature of aluminum coils. The bass and treble are both perfect and provide exactly the right amount of punch. The patented EAR technology of this model ensures direct signals to your ear, creating a full sound effect. This item also comes with detachable cables. You’ll get one 3 meter cable with a 1/4 inch jack and another 1.2 meters with a 3.5 mm standard jack. The SYS 38 transducers ensure lowest possible distortion to help you play much cleaner. You’ll only hear a low distortion when playing bass heavy tracks. Overall, its ergonomic design and sturdy build with an innovative set of features make the Sennheiser HD 598 SR stand apart from other products available on the market. This premium headphone is a perfect choice for practicing on those late nights without disturbing your neighbors. When it comes to music and stereo appliances, Sony needs no introduction. Our editor team has chosen the MDR7506 from the Japanese manufacturer due to its rich set of features at a very competitive price tag. It will surprise you when you find out how many premium features Sony has packed with this model at such a low-end price tag. This model features a closed back design which targets to prevent any audio leakage. Which in turn causes the output to be less spacious though. However, at 63 ohms of impedance, the MDR7506 can tackle a wide range of gains without having you to spend a fortune behind it. The frequency response is quite accurate, especially the mid-range responses. A stellar bass response makes sure you don’t have to spend most of your time with the EQ. The headphone is lightweight but still features a sturdy high-quality build. You’d not find any issues with comfortability even after a long practice session. The large diaphragm adds even more leakage prevention with its closed-back design. The large neodymium magnets with its accompanying 40 mm drivers ensure a crisp and balanced tone. However, this headphone can be quite hissy when playing treble heavy tunes. Still, it beats every other product at its price range. This model is easily foldable, which makes it take less space and ensures convenient transportation. One thing that might be a little turn off for many users is its lack of detachable cables. Although the 10ft fixed cable is long enough for moving around in your apartment. The cable also features both a 1/4 inch and a 1/8 inch jack for added applications. 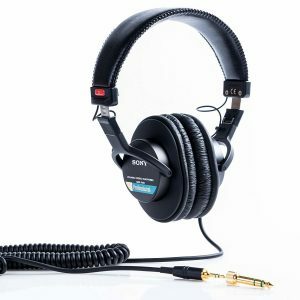 Although the Sony MDR7506 may seem a little behind in terms of specifications than our previous mentions, it triumphs them when it comes to price. You can check its reviews on Amazon to find out what other users had to say about this exceptionally cheap yet studio-grade headphone. If you’re looking for literally the best possible headphone for your guitar amps and willing to pay big bucks, then the Beyerdynamic DT 770 Pro might be the best solution for you. This product is manufactured in Germany and boasts arguably the richest set of features for your guitar amp. The Beyerdynamic DT 770 Pro features a closed-back model. The silver cushions are presented to provide maximum comfort for long sessions. This item features a spring headband for a firm and comfortable fit. The single-sided cable removes any hassle you’d face while taking it off. Along with its premium build the Beyerdynamic DT 770 Pro boasts an 80 ohms of impedance for exceptional amp performance. The details are crystal clear while the sounds are very natural and crispy. The reproduction is out of this world while maintaining an outstanding performance at the same time. The bass quality of this headphone is the best we’ve tested and with Beyerdynamic’s patented Bass Reflex innovation they make sure you don’t miss a bit of it. The DT 770 Pro comes with smooth velour earpads to provide you the most comfortable music sessions. With its flawless noise cancellation feature, you can enjoy your practice sessions without any outside disturbances. The cable is detachable and every part of this item is replaceable too. This makes the DT 770 Pro exceptionally long-lasting. Almost every reviewer on Amazon is praising the longevity of this product. Overall, the Beyerdynamic DT 770 Pro IS the most advanced and highest quality headphone for your guitar amps. Our editors have only picked the Audio-Technica ATH-M50x for the first place solely due to its insanely low price relative to its features. 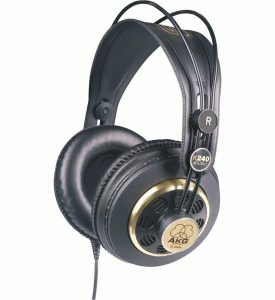 The AKG K240 is an affordable yet feature-rich headphone, perfect for using with your guitar amps. If you’re in a tight budget and looking for premium specs then this is a must-check headphone. The semi-open self-adjusting headphone is really comfortable and the build is solid and rugged. An ergonomic design with a non-twisting headband makes this product really stand out. The sound clarity is exceptional considering the bucks you’ll be paying for this headphone. With an Impedance of 55 ohms, the AKG K240 will sustain more than enough gains for your practice sessions. The tone is deep yet natural, although at max volume it tends to produce a little distortion. The frequency range of this headphone is between 15 -25kHz. Reproduction of sound is pretty fast and accurate. The extra large transducers with AKG’s innovative Varimotion diaphragm ensure an amazing response. It also produces a natural soundstage feel. The loss-free transmission with its well-balanced natural crisp sound has made this headphone extremely popular among lower-end consumers. However, the sound may feel a bit overdone with bass and tends to explode at higher volumes. But the treble is all clear. The detachable cables are of course a big plus for this product. In the end, the AKG K240 is definitely the best choice in a low-end price range. It offers many of the premium features provided by the above-mentioned picks at merely 1/4th the price. So, we’d definitely recommend this headphone to buyers with a slim budget. Buying a headphone for your guitar amps can be overwhelming. But, with the right choice, you can feel the difference within days. When choosing the perfect headphone, you need to take various aspects into consideration. Always try to determine your budget first. Then browse the most popular options within your range. Our experts have picked these 5 items keeping all the consumer bases in mind. We’ve presented the most premium units, mid-range units that match many of the specs provided by the high-end models and low-end items with the most necessary features. What’s the best headphone for you in this list? Only you can answer this question. We can merely hope our seriously curated list and expert insight can lead you to a perfect practice session anywhere you want. How to get free UC PUBG on PUBG mobile?